While environmental issues are Nate's territory, I usually can get a sense of what's going on in the green scene by reading the articles and op-eds about it. When it comes to the BP spill in the Gulf of Mexico, however, I am very lost. And the scary part is, I think that those in charge of getting this thing under control are just as lost as I am. 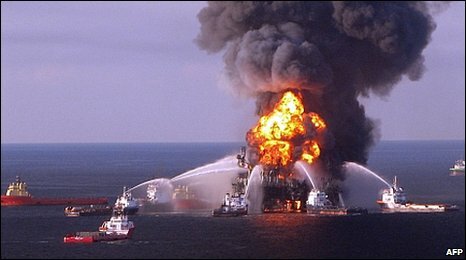 It's been nearly a month since the Deepwater Horizon (the subcontractor hired by BP) oil rig exploded, killing 11 workers and spilling millions of gallons of oil into the ocean. Yet critical questions remain unanswered, namely how much oil is spilling into the ocean and at what rate? BP continues to say that there is no way to reliably estimate how much oil is coming out of the pipe a mile below the ocean's surface, but the "official" tally is around 5,000 barrels a day (one barrel = 42 gallons). Independent experts have put the number somewhere between 20,000 and 100,000 barrels a day. Either way, no one really knows. What does not help is the lack of access of non-BP and non-governmental entities in the area. According to CBS, it appears that the Coast Guard, a branch of this country's armed forces, are helping BP contractors keep journalists out of affected areas. When pushed on why they were doing it, a Coast Guard officer said, "This is BP's rules, not ours." Needless to say, this is not the way that the country's armed forces should be used; they should not be protecting private interests, but public ones. And how are our politicians dealing with it? They're bitching over partisan talking points...again. Republicans are blaming the Obama administration, Democrats are saying Obama had nothing to do with it. As always, the truth lies somewhere in the middle. But just to give you a sense of how bad things are politically concerning this oil spill: Republicans are calling for more regulations of private industry. If someone can explain to me what exactly BP and our government have done the past month to try to fix this thing, I would greatly appreciated it. From what I've read, it sounds a lot like trial and error, which is a technique that has no business in a situation as serious as this one. Cars are parking themselves, our cell phones are mini super-computers that fit in our pockets, and we sent men to the moon over 40 years ago, yet it is going to take more than a month to stop the flow of oil out of this pipe into the Gulf and, to boot, we don't even know how we're going to do it? Embarrassing.